Most of the fan bases have created photoshop images and memes of Bryce Harper in their team’s uniform. The Winter Meetings start in exactly two weeks in Harper’s hometown of Las Vegas and get ready for a barrage of Harper sightings and more rumors. Harper will have to weigh all of the offers he receives which will have to exceed the $300 million for 10 years that the Washington Nationals reportedly offered. Harper and his advisers will most likely weigh the tax implications of any signing. First off, Harper’s permanent residence is in the state of Nevada which has no state income tax. It would behoove Harper to defer dollars past his playing days when he is living full-time back in Nevada. We reached out to tax attorney Brandon Leopoldus, Esq. who specializes in sports and entertainment law. Leopoldus agreed that Harper must carefully weigh the tax consequences in determining where to play and that the decision is based on what he said is called the “Jock Tax” in the industry. The tax rate that states and some municipalities attach to players who play in stadiums in those states and municipalities vary greatly. As Leopoldus told us, the “Jock Tax” is not the only tax consideration free-agents have. The division teams play in are also important as the NL West and the AL East have the highest “Jock Tax” implication because you often pay taxes based on the states you play in. 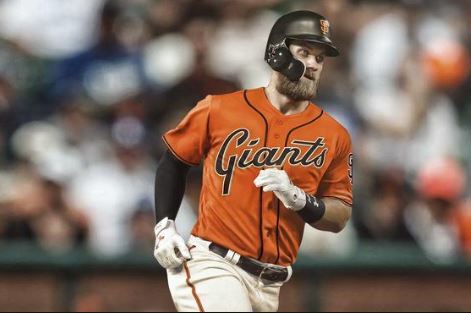 For example, if Bryce Harper signs a $330 million deal with the San Francisco Giants, he will have a state income tax rate of 13.3% (or $43.89 million!). That number does not get cut much when you consider the Giants will play additional games against other California teams (A’s and Angels in Interleague play, and the Dodgers and Padres in their own division). With the new tax laws that took effect on January 1, 2018, athletes as high-earners will feel the sting on limitations on real estate taxes and other itemized deductions which will limit or eliminate writing off real estate, and state and local taxes (SALT) at $10,000 and itemized deductions for Forrm 2106 “employee” business expense have been eliminated. Many athletes will no longer be able to write-off their fees paid to agents on earnings while they must be more creative on agent fees paid on endorsements which usually run 20% in the industry. Next, the athlete and his representatives should consider the tax rates in the other cities/states the athlete will be playing their away games. With the Phillies like the Nationals, they will play some road series in states that may be beneficial because of no “Jock Tax” like Florida. Another great point by Leopoldus is Harper must also consider which team will provide him with the most marketing opportunities. Harper, who lives in Nevada in the off-season and maintains a residence there, and if he does not have a Nevada company to run his ancillary revenue through — he should. Ancillary income would be for his non-baseball playing income such as endorsements, public appearances, autographs etc. These companies are taxed as a pass-through and with the newest tax law in effect, this pass-through income is taxed at a much lower rate. The tax map (above) only accounts for top state income tax rates but does not include personal property tax, excise tax, sales tax, and municipality tax rates. Philadelphia has a city income tax that is higher than Pennsylvania’s overall tax, and they charge a commuter tax that athlete’s pay, and it is nearly another 4%. 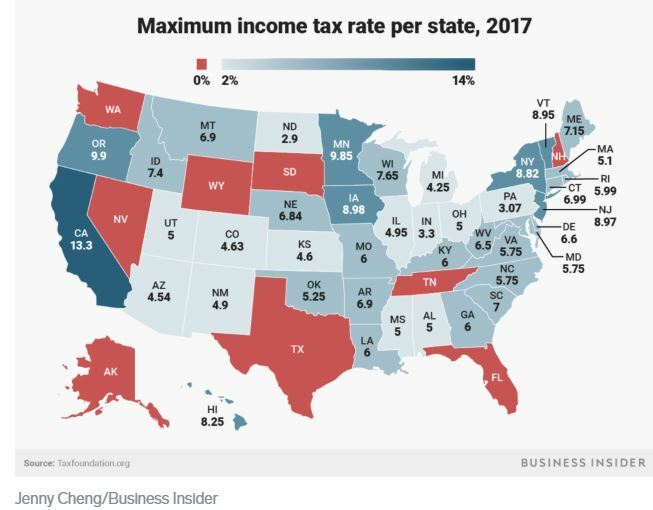 The California state tax is the highest tax in the U.S. but New York City is not far behind when you add in their 3.876% personal tax rate with no deductions allowed. Chicago residents do not pay a city income tax per se, but they have the most excise taxes of any city in America. At the end of the day, Nationals players will pay among the least amount in taxes among the big market teams. The savings could be near 6.5% to Harper giving the Nationals an advantage of $1 to $3 million a year versus some of the other teams looking to acquire Harper. Multiply that by 10 to 15 years and the differences are enormous. Leopoldus also points out that California has a law (Cal. Labor Code Sec. 2855) that only allows an employment contract to be in force for seven years. Mike Trout had a similar situation when he signed his six-year $144.5 million deal with the Angels. This law would likely provide Harper an out after 7 years – but for the nature of the contract (if he received a 13-year deal with the Giants, it is likely he would play it out. At the end of the day, this final decision by Harper should not be hinged solely on just a financial decision based on what a team offers, but many have theorized that Harper will go for the largest contract to break the Giancarlo Stanton record of $325 million for thirteen years. With $300+ million for Harper as almost a certainty, he will create financial security for a few generations in his family, but money is only part of the equation for a baseball player of his talent. If Harper wants to win above all else, he should also consider the team that he thinks can get him a championship ring on his finger. Remember, when Harper gave his infamous line, “where’s my ring?” he still does not have one. Harper must decide what his priorities are for the rest of his baseball life as that is what he is signing away with his next contract that will most likely keep him tied to one team for the rest of his career. On the surface, change is great until it is not. The grass is not necessarily greener on the other other side. There are other decisions besides the financial impact and winning. You have to consider the geography and the city itself. Some of these fan bases and media are much tougher in some cities compared to others. Philadelphia and New York have a history of criticizing players aggressively when they do not perform to their expectations. No decision will be easy as prospective teams will roll out the red carpet for Harper in the recruitment efforts. The tax ramifications will result in millioms for Harper, but this is also an issue for any players considering the Nationals versus other teams. This entry was posted in Harper. Bookmark the permalink.